AnyMP4 MP3 Converter for Mac can not only convert any audios to MP3, AAC, AIFF, ALAC, WAV and M4A, but also extract audios from the video files and then convert them to MP3, AAC, ALAC and other your needed formats for Mac. Besides, it owns powerful editing functions like trimming the audio to your needed length, merging audio segments into single one, adjusting audio settings and renaming your audio. So you are able to enjoy these audios on your portable devices like iPhoneSE, iPhone 6/6 Plus, iPad Air, iPad mini, Samsung GalaxyS7 and so on. This Mac MP3 Converter can convert any audios like FLAC, WAV, WMA, MP3, AAC, AC3, AIFF, etc. to MP3, AAC, AIFF, ALAC, WAV and M4A with super fast speed and super quality. You can play the output audio file on iPhoneSE, iPhone 6/6 Plus, iPad 4, iPad Mini, iPod Touch, Samsung Galaxy Tab/Note, HTC, Kindle Fire, Sony Ericsson Xperia, etc. With MP3 Converter for Mac, you can also help you extract audio files from various videos like MP4, MOV, M4V, MKV, AVI, WMV,TS, MTS and so on. Then you can convert them to MP3, AAC, AIFF, ALAC, WAV and M4A. So you can enjoy your audio at any time and any places. With this software, you can trim the audio to your needed length by setting the start time and the end time, you can merge several audio clips into one file. Meanwhile, you can rename you audio with a unique name so that you can find your video more easily. 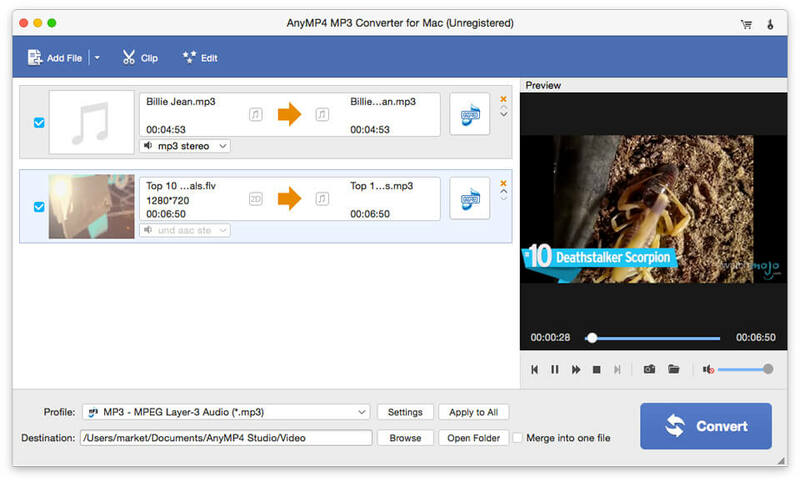 AnyMP4 MP3 Converter for Mac has a user-friendly interface, which can help you use it easily. Only a few clicks can you finish the whole processing. Besides, it supports batch conversion, so you can convert several files simultaneously.